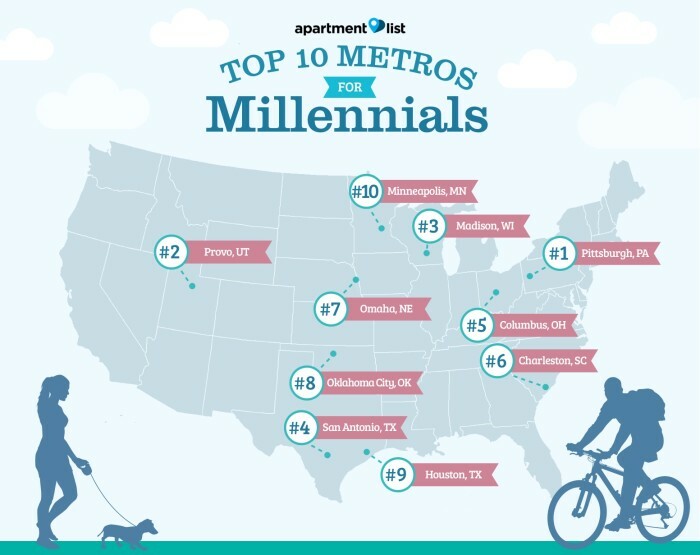 What Are the Top U.S. Metros for Millennials? What U.S. metros are the best for millennials? To answer that question, Apartment List graded 75 top U.S. metros in three categories — jobs, affordability and livability — and ranked them, based on their scores. Many metros score high in one or two categories, but few metros offer the ideal mix of a strong job market, affordable rent and home prices and high livability scores. The best three metros for millennials are Pittsburgh, Provo, Utah, and Madison, Wis., which all earn A+ marks overall. Largely, inland metros, primarily located in the Midwest and South, rank higher than coastal metros, offering affordable options for millennials, in addition to strong job markets and plentiful entertainment options. Metros where millennials traditionally move — San Francisco, Los Angeles and New York — and where millennials have recently been moving — Seattle, Austin, Tex., and Denver — receive low scores for affordability. Despite strong job markets and high livability ratings, rents in these metros are too expensive for many millennials, and homeownership is far out of reach for most. Making a move to a new city is both scary and exciting. A big move can mean leaving friends and family behind, starting a new career or experiencing an entirely new climate. In our recent survey of 24,000 renters, 64 percent of renters say they plan to settle down in a different city than where they currently live. Affordability concerns drive renters away from pricey coastal metros, while renters leave the Midwest and South in search of better job opportunities. Millennials, aged 18 to 34, have higher rates of migration, compared to older adults, frequently relocating for better jobs, cheaper housing or a more exciting social scene. From 2007 to 2012, millennials made up 24 percent of the total U.S. population, but accounted for 43 percent of all movers in the United States. In order to identify the best metros for millennials, Apartment List created an index to grade 75 top U.S. metros on jobs, affordability and livability. We calculate the score within each category based on how the metro compared to the others in the study, with overall grades and rankings determined by the average score of the three categories. The metros that top our list provide millennials a balance between a strong job market and reasonable rent and home prices, as well as a lively social scene. We give each metro a numerical score based on its ranking compared to other metros on each of the study’s three categories. We calculate final scores for each category by averaging of the scores for each factor within the category. Finally, we determine overall grades and rankings by calculating the average of the three categories: jobs, affordability and livability.